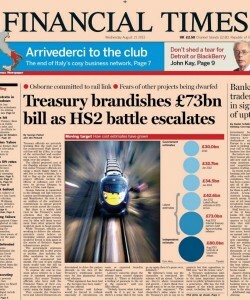 Treasury officials have told the Financial Times that the cost of building HS2, currently officially at £42.6bn, would be closer to £73bn in cash terms. The official construction costs are already two years out of date as they are set on 2011 prices, and do not include VAT which the National Audit Office believes would be unrecoverable. Both the £42.6bn and £73bn figures do not include the cost of trains, which are currently set at £7.5bn in 2011 prices, despite the fact it would be around a decade before any trains are needed. This revelation comes hot on the heels of a report from the Institute of Economic Affairs who said that HS2 would cost around £80bn. The IEA arrived at this figure by adding the cost of trains and estimating costs for further mitigation, additional connections to the rail network to ‘plumb in’ HS2 and regeneration funds, not inflation and VAT as the Treasury have done. The Stop HS2 campaign maintains there will be additional costs to HS2 which are not yet factored in, such as the true cost of compensation and other factors as yet omitted from published designs, such as farm and foot bridges. How can it be right when MPs vote on hs2 they are threatened with demotion and no promotion from the whips telling them they must tow the party line and vote for hs2 even when they know it is a total waste of money and should not go forward . It’s a disgrace that our leaders can do this with our taxes on a none starter project just for the rich to save a few mins of time. And put 500k of people’s lives on hold .We all like to think our country is a fair place to live but we could have more rights in china .How our leaders can dictate to other nations how to treat there own people when what they are doing with hs2 is forcing on to there own people something no one wants and think it is just a total waste of there taxes .we have all been sending our MPs our thoughts on hs2 but what can they do when they are blackmailed by there bosses it just not right . Because @J.davis – that’s how the (party) political process works in Britain. HS2 strategy, due to its long term timescale and requirement for compulsory purchase / land acquisition / rights of way diversion powers, is necessarily driven by political consensus. It’s become increasingly apparent that the political aspect of HS2 debate is paramount – however whenever I try to raise this feature within these columns, Penny Gaines (moderator) cries foul; off topic? Party politics in Britain is inherently tribal in nature, boasting an unspoken yet fierce loyalty to the leadership (who are in turn expected to deliver victory) and an essentially hierarchical structure in which those at the lower echelons constantly strive to climb higher up “pecking order”. Each tribe provides a statement of values, beliefs and aims for the forthcoming period (traditional five year Parliamentary timetable) and the electorate has its chance to judge each tribe on a) its past performance & b) an assessment of future strategies (policy pledges). That summary of future pledges is called a manifesto. The only surprise here is why you are surprised? The evidence that, HS2 is a monumental mistake by the government,continues to be shown .When will they just say that they have reconsidered and it is not the right investment at the moment.Ludlow was to have a new hospital,far better that it is built with the money.The plans for railway expansion that have been presented as an alternative could also proceed.